I was just listening to the BBC commentary - it was said during the fourth round. If it was wrong - then I blame the BBC and my own ignorance for not knowing any better. Checking the credits it must have been perhaps a conversation between Peter Allis & Andrew Cotter (I recognise Ken Brown's voice and it wasn't his). For the first time ever, I listened to a golf tournament on the radio. Not too bad actually. Did catch the final two holes. While Jordan may not have the sheer firepower that Rory possesses, he is near that same level IMO. Great win and 3 majors and counting puts him in some very rare air. beninho wrote: He is slow, they were already a hole behind the Koepka/ Connolly group before he the fun and games on the 13th. What commentator said he was fast? He's fast once he addresses the ball. Otherwise not. Maybe that's what they meant. Just looked at the list of multiple major winners, considering how long they have been played, having only 45 people with 3 or more shows how difficult it is to win them consistently over time. Pretty sure that's what they mean ... I've heard more than once it said that he's quick to pull the trigger once ready .. just takes a long time to get ready! Shotrock wrote: For the first time ever, I listened to a golf tournament on the radio. Not too bad actually. Mentally yes. Jordan never seems to get the slumping shoulders complex that Rory (and so many others) shows. But for sheer shotmaking, Rory (when on) is equal to Tiger IMO. What puzzles me is how the practice ground can not be out of bounds? Theoretically you could have a player hitting a shot off the practice ground whilst others are bashing practice balls over his head. Health and Safety anyone? As I said earlier in the thread Rory needs to realize that the superior swing is not beating superior mental state on the course when it comes to winning golf tournaments. Does Rory ever hit it all over the place, like Spieth at the 2016 Masters and 2017 Open, and still compete to win the major? No way Jordan Spieth win over 10 majors. Only 3 people have ever done that, and one was back in the 1920s. Too many can win the big events, the playing field is closer now than ever due to the advancements in equipment and how players train. Just like Tiger's 14 were harder to win than jacks 18, anyone winning 10 now would be the equal of Tiger. So, Spieth will have to be very good to reach 10. Spieth is only 23 / 24 and is still developing his game and experience levels. I have heard it said (again from the BBC commentators) that Spieth is physically and mentally suited for a long time at the top of golf. They were inferring he is built out of stone, whereas Rory McIlroy has physical issues - and is having difficulty keeping up with some of the others (physically). There was a period of about two years that Rory McIlroy was playing like a golfing god/great - then he had that "footballing" injury and things haven't seemed to be quite the same again presumably for various reasons. He is still young so he should have plenty of future opportunities. They had just completed the first nine hole in under two hours and the group in front (Koepka-Connelly) was on the 11th hole. Say what you want about 2 hours for nine holes, but that it the SOP for professional golfer on the EuroT and PGAT. And with Koepka Connelly on the 11th hole, they were NOT out of position IMO. If this is true, what kind of chicken $h!t officials do the R/A have? Asking a caddie do their job? Was this guy afraid of Stenson & Mickelson? No name Bertie wrote: Is Spieth the Ronnie Sullivan of the golf world? Commentators where saying Spieth is one of the fastest payers on the golf course if not the fastest - taking his shots on average between 8 to 14 seconds when it is his turn to play. They compared it with another player Matsuyama who was taking 1 minute 15 seconds on average. Either you're confused, or Alliss is confused. Spieth is slow, very slow, and he fell behind on sunday. I was listening to some BBC radio commentary earlier on Sunday where they said that AUSTIN CONNELLY was taking on average 8-10 seconds when it was his turn to play his shots, and that CHAN KIM was taking on average 1 minute 15 seconds. As Ben and Blue have already said, I thought it was very strange that the practice ground was not OOB. Compare with Hoylake where the OOB practice ground in front of the clubhouse is the key challenge on 1st and 16th holes (3 and 18 in the Open). But I wouldn't describe it as a tainted win. On 13 he used his presence of mind to take an unplayable. It wasn't a free drop - he did get a penalty. If he'd hooked his drive into the left hand rough he could have done the same thing and kept going back until he found the adjacent fairway (11th). It's no different. Spieth was a worthy winner, it was a shame that none of the chasing pack were close enough to put him under pressure. He was always able to keep an eye on Kuchar his only genuine contender. The other thing about 13 is that IF the practice range had been out of bounds, he'd have found somewhere else to take his penalty drop - maybe not quite as favourable (perhaps?) but maybe somewhere closer to his original position with a better lie than he had which would probably have got him back into the hole anyway. He just too the best option available to him. From the looks of the course layout, if the practice area was OOB, he would have had to drop in the long stuff that he was close to and then would not have had a chance to hit the hybrid that he did, hacked it out, or he would have gone back to the Tee. If any of these were better options he would have taken them. I feel maybe it was an oversight to not make it OOB, as they didnt expect it to actually come into play. Still not a tainted win though. Golf Channel post game show did a feature with R/A Rules official, reconstructing the Spieth's ruling on #13 and the shot. R/A rules official said that they had looked at making the Practice Area OB but there general policy is to have the course play like it does for the other 51 weeks of the year. They put in the internal one-way OB on #9 because of health and safety reasons. Trouble being that worldwide coverage would have ceased!! 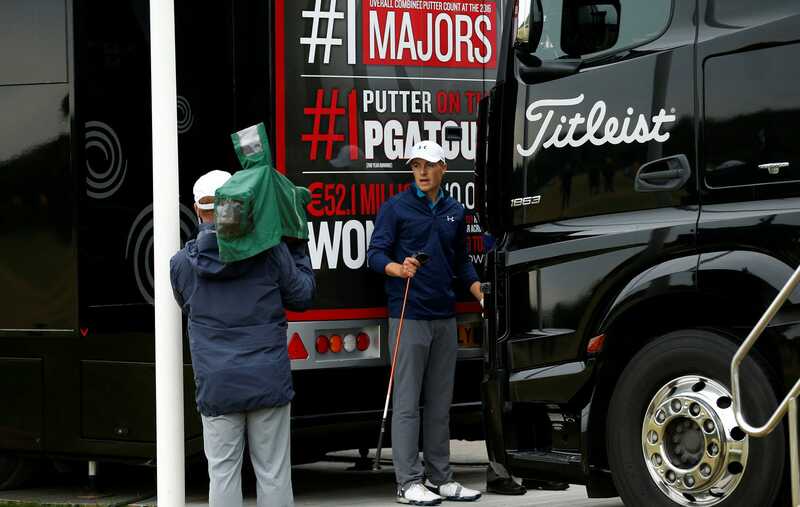 Andthe sticker on the truck says "# 1 putter on the PGATour". beninho wrote: No way Jordan Spieth win over 10 majors. Only 3 people have ever done that, and one was back in the 1920s. Too many can win the big events, the playing field is closer now than ever due to the advancements in equipment and how players train. Pretty bold prediction there SirB!!! - "difficult for me to see him fall short of 10 majors at the very least"
Spieth might peak at 24, plenty of others do (Rory?). He may find himself over taken by power hitters who bomb it past him and create so many easy birdie chances that they convert a high percentage without needing Spieth's putting skills. Spieth might get injured, become addicted to hookers and prescription drugs. He might drive into a fire hydrant, etc etc. Or in the next couple of years we may see another Jack / Tiger emerge who dominates the game and wins everything. They were both, Spieth in particular, playing pretty poorly. Of course they were taking more time. They were the only two really in it, playing for The Open and nearly $2m for first place in prize money alone. McLaren wrote: Just like Tiger's 14 were harder to win than jacks 18, anyone winning 10 now would be the equal of Tiger. So, Spieth will have to be very good to reach 10. Birkdale was relatively short, a second shot course. Spieth may find his limitations on longer courses, where he's forced to pull out his driver more often. I'm not saying he can't play long courses but his results seem to indicate he's doing relatively better on shorter courses, eg. Colonial, Pebble Beach, John Deere. Dunno, is there a trend / correlation? Speith is NEVER quick. He's Kevin Na with a bible. I'd happily annexe NI from the UK. As far as I can see they bring nothing to the Union and simply embarrass it. I genuinely feel sorry for good decent people in NI that are stuck between the extremists. Personally Super I wouldn't want NI either, it would be a total cluster fuc, the Shinners are extreme socialists and the DUP want to be bankrolled for sitting around thinking up stuff like in the above article. It would be a disaster in many many ways. I just wish the political parties would get on with serving the best interests of their constituents by creating an environment that encourages economic growth and prosperity, instead of the childish political oneupmanship that seems to dominate their agendas. Maybe a civic forum with US intervention is needed to remind the parties that the vast majority of people voted for peace and progress and remind them of their duty in sticking to that. They are currently off on summer holidays having not sat in the assembly since Christmas. Totally self indulgent. I must confess I'm not a huge fan of the circus that seems to surround Beef and while I can see he is probably good for the image of the game he does come across as a bit of an oaf. Another :yawn:. You're missing the point of my post and a Bible is not remotely relevant here. Parry is clearly a berk and 'Beef' is riding the (short-lived, unless he can actually deliver on the golf course) wave of media fame for what he can get out of it. Can't say I blame him that much really I guess. I have to say, I'd happily garrotte the idiots in the crowds last week who shout "Beeeeeffffff!" (or "Koooocccchhhhh!" for that matter) every single time either hits a shot, holes a putt or perhaps even farts. This Spieth/Bible reference is clearly case a confirmation bias. I have seen a lot of Spieth pressers, and I have never seen him bring up the topic of religion on his own. He did talk about is "faith" in one Birkdale pressers, but he never mentioned "Jesus" or "Go"; he only talked about his faith. And that was in response to a question. He did not bring up the topic. Religion is no more relevant to Spieth than it is for Sergio and Rory who both wear religious jewelry. I didn't miss the point. Whether Spieth is in pole position or stinking the house out in last place, he's slower than a snail on crutches. The significance of the occasion on Sunday is of no bearing. He's never quick and never has been. I liked the Ken on the course feature which covered the par 3 7th at Birkdale. When Ken walked over to discuss the depth of the greenside bunkers, "Beef" emerged as if he'd been sleeping rough in the bunker and ran off like a confused tramp. I don't know if it was staged or if Johnston was on the course at the time and it was a spur of the moment joke. You can call him a clown but I liked the self deprecating humour. Golf is full of people who take themselves too seriously. GPB wrote: This Spieth/Bible reference is clearly case a confirmation bias. How is it confirmation bias? I compared him to Kevin Na in terms of his pace. The bible quip was just that, a laugh at his credulity. He's slow whether he's a bible bashing loon or a logical thinking scientist. That's not even up for debate. pedro wrote: Birkdale was relatively short, a second shot course. Spieth may find his limitations on longer courses, where he's forced to pull out his driver more often. I'm not saying he can't play long courses but his results seem to indicate he's doing relatively better on shorter courses, eg. Colonial, Pebble Beach, John Deere. Dunno, is there a trend / correlation? Maybe it's because the shorter a course is, the more it becomes a putting competition, which plays to Spieth's strengths. Longer courses provide more test of ball striking / driving where he doesn't excel. Although let's be fair, Spieth is no short hitter - he's added distance to his drives since he first came on the scene. Perhaps links plays into the hands of Boredan Spieth though. Lots of run, which he might not get on a long US style course. So why mention it? I'm going to lay down a challenge to you. He may be a "christian" - whatever that means - but I've never seen him give a presser where he mentions it to any great extent - apart perhaps from where he is directly asked about it. So your challenge is find me a YouTube clip - or even a written word article - to back up your hysteria over him. I'm no fan of bible bashers either but I just don't see it with him. As I pointed out yesterday, when Spieth and Kuchar were told to pick up the pace, they were on th 10th hole, they had just completed 9 holes in 2 hours, and the group in front was on the 11th hole. While I acknowledge 2 hours is slow for a two some to play nine holes, it is not slow by Pro Golf Standards. They finished the 18 holes in 4 hrs 15 minute, about 30 minutes behind Koepka and Connelly. If it were for 20 extra minutes it took to play hole 13, they would have been right behind Koepka and Connelly. Spieth may not be the fastest player on tour, but by no means is he a Kevin Na or a Paddy Harrington. IMO, it is absolutely foolish for Tour player to be fast. A fast player is never going to be able to play at his pace because he is always going to behind a slower player. And Tour golf it is a two-lane highway with a gray haired lady ahead of you in a no passing zone. I dont think you have to be a fast player, just a ready player. How often have you sern one player hit then the next player straight away. It does happen. Spieth is on the slow side of pro golf, he has admitted it himself. He aint no jason day though. I don't have to find anything Davie. Ive read spieth mention how his sister keeps him grounded more then he has mentioned religion. The guy seems fine, comes across well, I cant fibd any reason to not like him. No you don't. You can just keep on banging on with no basis in fact or proof. Wasn't it you who kept pestering Mac for "proof" of what he was claiming? super_realist wrote: I don't have to find anything Davie. So you have carte blanche to make sh*t up? For a world famous athlete Spieth seems like a pretty OK guy, and is hardly the most vociferous bible basher. Is he even old enough to have the life experience to abandon a childhood religion? As a fan of golf I will happily take a guy like Spieth at the top of the game.